The Record Chooser is an interface that allows users to navigate through multiple samples on a given form, for a given location. The button will only be enabled if there are more than two records from the selected location. Select the desired record to view in the EDGE form. 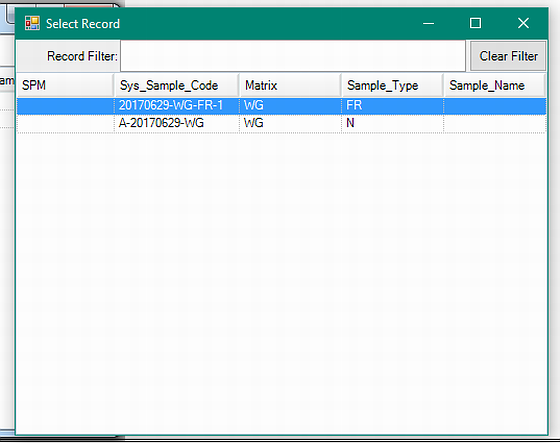 The record filter in the Record Chooser can filter through a list of samples from a single location based on any populated field (e.g, SYS_SAMPLE_CODE, MATRIX, SAMPLE_TYPE). For example, typing 'A' or 'N' into the filter for the above image would display only the 'A-20170629-WG' sample.